I recently acquired a Yaesu FT-897D with the optional internal batteries, and the plan for this transceiver is for it to be operated in the outdoors from wherever the location may be. I also built a portable vertical antenna to be used with this rig, and same thing applied as to where it will be put to use. Now it goes without saying that keeping them out of harms way while transporting them was a priority, and I think the photo speaks for itself as to how I went about this. 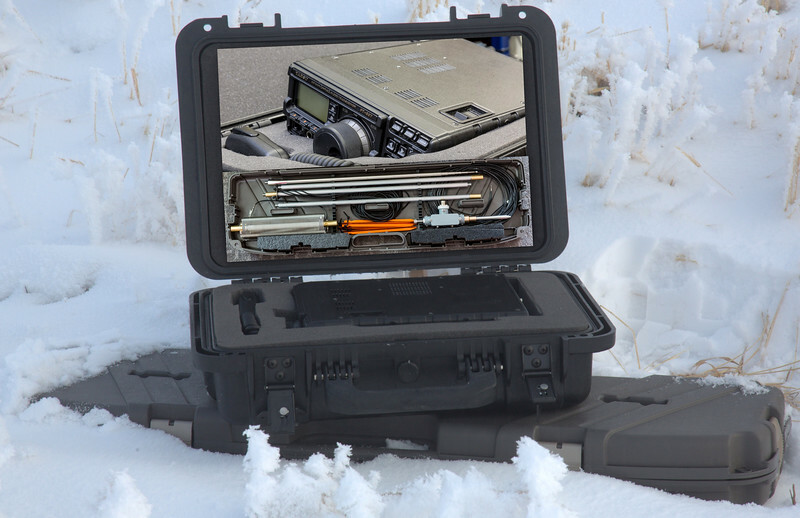 The case that the FT-897D resides in, I actually found at a Cabela's outdoor store, and the case similar to a Pelican case is meant to store handguns in, but my tape-measure told me that my FT-897D would fit in it just fine., and the cost was half of a Pelican case of similar size. Now having said that, it is not a Pelican case, but the build impressed me enough to trust it with my FT-897D stored within. The case that my 10-60 meter portable antenna resides in, I found at Princess Auto in the surplus department, and it was meant to store archery arrows in, but worked out perfectly with a few modifications for the job at hand of keeping my antenna safely stored within. On this morning with the temperature sitting at -21 Celsius, it was important to keep them out of the elements.